Citation Information: JCI Insight. 2016;1(10):e87059. https://doi.org/10.1172/jci.insight.87059. DC vaccination with autologous tumor lysate has demonstrated promising results for the treatment of glioblastoma (GBM) in preclinical and clinical studies. While the vaccine appears capable of inducing T cell infiltration into tumors, the effectiveness of active vaccination in progressively growing tumors is less profound. In parallel, a number of studies have identified negative costimulatory pathways, such as programmed death 1/programmed death ligand 1 (PD-1/PD-L1), as relevant mediators of the intratumoral immune responses. Clinical responses to PD-1 pathway inhibition, however, have also been varied. To evaluate the relevance to established glioma, the effects of PD-1 blockade following DC vaccination were tested in intracranial (i.c.) glioma tumor–bearing mice. Treatment with both DC vaccination and PD-1 mAb blockade resulted in long-term survival, while neither agent alone induced a survival benefit in animals with larger, established tumors. This survival benefit was completely dependent on CD8+ T cells. Additionally, DC vaccine plus PD-1 mAb blockade resulted in the upregulation of integrin homing and immunologic memory markers on tumor-infiltrating lymphocytes (TILs). 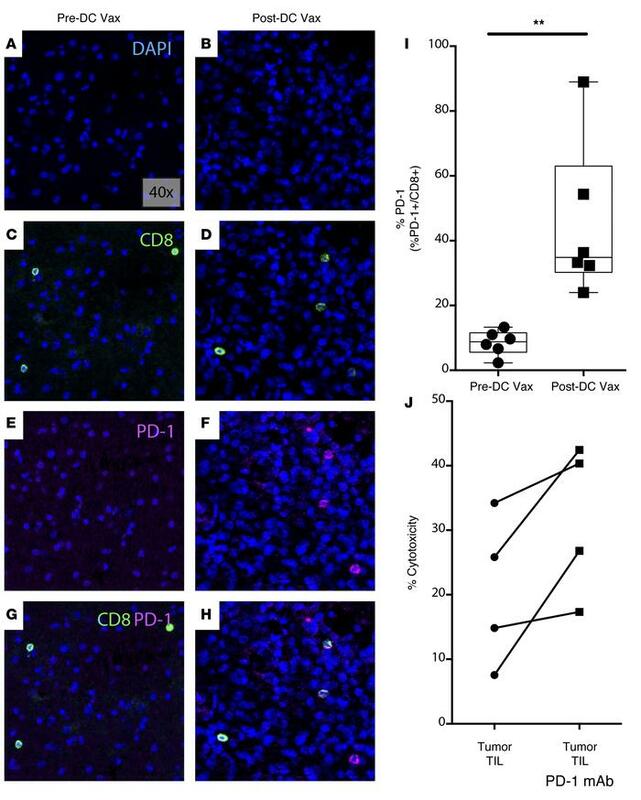 In clinical samples, DC vaccination in GBM patients was associated with upregulation of PD-1 expression in vivo, while ex vivo blockade of PD-1 on freshly isolated TILs dramatically enhanced autologous tumor cell cytolysis. These findings strongly suggest that the PD-1/PD-L1 pathway plays an important role in the adaptive immune resistance of established GBM in response to antitumor active vaccination and provide us with a rationale for the clinical translation of this combination therapy. Ex vivo PD-1 blockade enhances TIL cytotoxicity against human GBM. (A and B) 4’,6-diamidino-2-phenylindole (DAPI), (C and D) CD8, (E and F) PD-1, and (G and H) CD8 and PD-1 costaining is shown across pre- and post-DC vaccine samples from a representative glioblastoma (GBM) patient (40× magnification). (I) Percent PD-1 expression on CD8+ TILs across pre- and post-DC vaccine treatment patient samples was quantified (n = 6) (**P<0.01). (J) TIL cytotoxicity against human GBM at 15 hours with and without PD-1 mAb blockade is shown (n = 4). Each point represents 1 subject (I and J). Box-and-whisker plots were used to graphically represent the median (line within box), upper- and lower- quartile (bounds of box), and maximum and minimum values (bars) (I). Statistical analyses were performed using the Student’s t test (I).